Yes, the opening ceremonies come later today in London, but a handful of events are already underway, and there's already been a world record established. 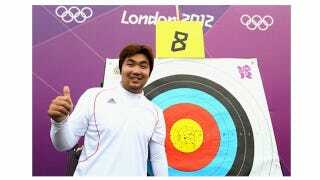 Im Dong-Hyun, an archer from South Korea who won team gold medals in 2004 and '08, broke his own 72-arrow mark by three points with a score of 699 during today's seeding round. Im and two South Korean teammates, who finished right behind him during the ranking round, also set the team world record with a point total of 2,087. And, yeah: Im does not wear corrective lenses or contacts when he competes, even though he has myopia and is considered legally blind. This is how he does it.